Editor's note: I am pleased to present another series of posts by Dennis Horne. Many years ago I conceived the idea of writing/compiling a book about Mormon books. Having dabbled in Mormon book collecting some myself when I could afford it, and having developed a deep interest in the fascinating history of the creation (the writing and publication) of many of these books, I began assembling historical information about various titles with the book idea in mind. I therefore launch this blog series, Mormon Book Bits, geared to those who have interest in Latter-day Saint history, doctrine, writing, and publishing. And especially to those who love Mormon books and know that they sometimes take on a life and create a history of their own, regardless of their actual content. Some of these Mormon-related book histories will be very brief, but others will be much longer (usually a reflection of how much information I could find on a title). Most of the historical material will consist of quotations written by others with knowledge about a particular book. Some blogs will read like historical articles, others will simply consist of a book title followed by an informative quotation. As a frequent visitor in many a Utah/Salt Lake City-area used bookstore, especially in past decades, I learned that both truthful and inaccurate stories often float around. I neither blame nor judge anyone for this exchange of information; such is part of what makes the subject fun and interesting. (On the other hand, sometimes the information posted by some Mormon book sellers using online auctions is pure fiction, but that fact applies to other auctioned products sold as well.) Another factor that keeps interest alive is that various General Authorities are a part of many book histories. This is only natural with so many books being written by Church leaders themselves and many others being noticed in some way by them. And of course, for some, anything involving the General Authorities merits attention. While book publishing (and collecting) is a very temporally (business) oriented pursuit—if publishers, including Church-owned publishers, don’t sell books they go out of business—I have not felt any guilt about collecting them myself since as I read the biographies of the General Authorities I discover that most of them assemble(d) fine large personal libraries. After all, nothing is better than to study from the “best books” and they know it. I have done my best to use accurate information, but readers should keep in mind that with such an area as this, much sensationalism and ambiguity (and sensitivity) can come into play. I apologize in advance for any misinformation that finds its way into Mormon Book Bits, I can only do my best. I assume I have missed or am unaware of information related to some Mormon books that I will include in this series. I have not tried to be exhaustive or comprehensive. I do think there are many others who love Mormon books as much as I do. Thanks for doing this, Dennis. A few reactions: First, doing a blog on the history of collectable books is a novel idea and is a terrific contribution to the collectible Mormon book world. I like books that have a story. Second, this post sounds more like a review than a history. Reviews are neither history nor novel. And this book has quite a history. Which brings up a third point. What makes this book unique and command such a price isn't the spiritual experiences. Lots of autobiographies have such stories. What makes Nelson's book unique is that he rather carefully describes the invitation to receive a second annointing (though in less detail than Joseph Bentley's very scarce and collectable autobiography, for example.) That and the limited printing are what makes it a pricey and scarce collectable, IMHO. That said, I'm glad you're doing this and hope you'll share more of the stories about books you've accumulated. Keith, thanks for the comments. The Mormon Book Bits will often be a mixture of history, review, and some collecting thoughts, but mostly history. I am aware of the reason you give for the books value, but chose not to mention it because of the sensitivity involved. I am however glad that the book did not have to go through Correlation and remains so candid and delightful and faith-promoting. I hope you enjoy future Mormon Book Bits as they are posted. Thanks for a great book nerd idea and review. This is much needed in the collectible Mormon book/ephemera world. Time to Tackle "Mormon Doctrine". Mormon Doctrine is being tackled and a Mormon Book Bit will appear on it down the road; that is a fascinating story and one that has been told partially slanted by some--think Prince & Wright. Your estimate on publishing numbers is too low. I happen to know of a lucky collector who bought a copy, and tucked inside was a copy of the invoice from the printer listing the number of copies made. I won't divulge it, but you would be surprised. As I remember, that number is only my own best guess made years ago, so I am happy to be corrected. 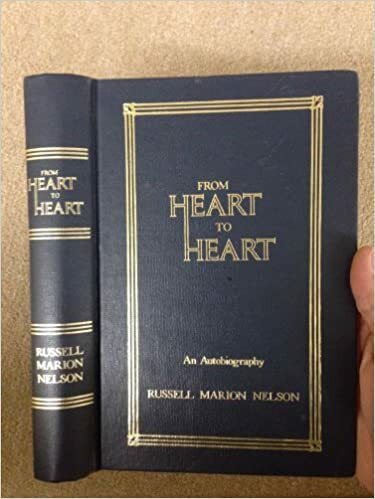 I have also had a collector tell me that the book was placed in some temples around the time Dr. Nelson became Elder Nelson. I had never heard that before, but of course, long ago the temples were known for having very nice libraries.